The Benjamin Franklin Treasure Trail was developed by Joe Kemp and myself for the ongoing celebration of Benjamin Franklin's 300th birthday. 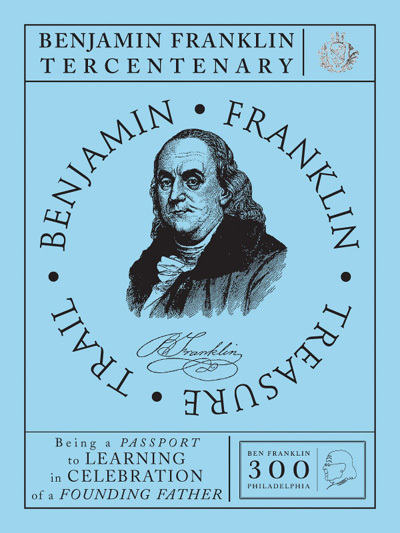 We were contracted by the Benjamin Franklin Tercentenary to design, print and deliver 6,000 passports during the year-long celebration. The passports contained information on twenty-one different cultural institutions that were celebrating Franklin. 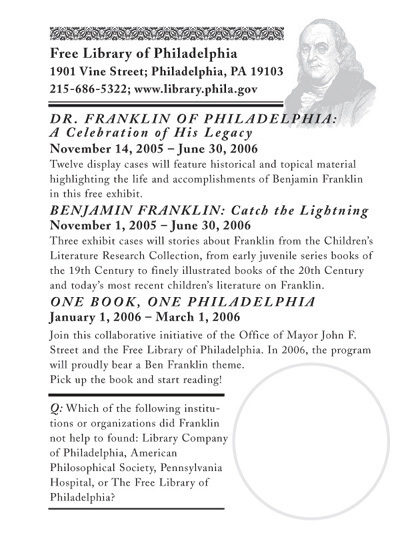 Each page contained information on the institution, what Franklin-specific exhibits/events they were hosting, a question to answer about Franklin, and a space for the participant to stamp his/her passport (stamping devices were located at each institution). Once at least five institutions had been visited, particpants could visit the Tercentenary website and answer the questions online. Five locations earned you the title of "Friend of Franklin," while ten was "Ingenious Inventor," fifteen "Junto Member," and all twenty-one earned you the title of "Esteemed Philosopher." And, anyone who became an Esteemed Philosopher was automatically entered to win a Franklin Goody Basket from the Tercentenary! 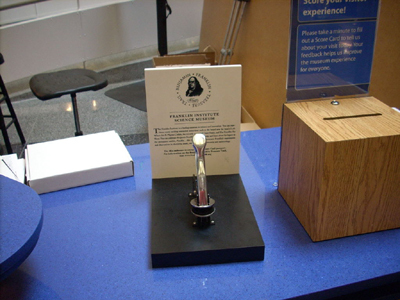 Stamping Station Still at The Franklin Institute!